A German high-speed train which is expected to offer a direct service from London to Frankfurt from 2013 was unveiled Tuesday at London’s St. Pancras station following safety tests in the Channel Tunnel. 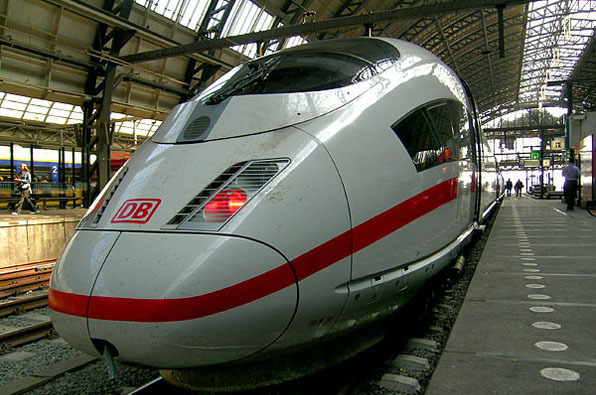 German rail operator Deutsche Bahn said it also intended to run trains from London to Amsterdam in the Netherlands. The network will also serve Brussels, Belgium, the Dutch port of Rotterdam and Cologne in Germany. The Siemens-built ICE 3 train, which has a maximum speed of 320 kph (200 miles per hour), will undergo further test runs and approval measures to use the Channel Tunnel. The service uses the UK’s first high-speed train line, High Speed 1, which was completed in 2007 and linked London directly to the continental high-speed rail network for the first time. Eurostar, which is jointly operated by the national rail companies of France and Belgium and a British subsidiary, is currently the only operator to run passenger trains through the tunnel, serving Paris and Brussels directly as well as ski resorts in the French Alps. That journey can currently be done in as little as five hours 37 minutes, according to the Rail Europe website, although the trip involves changes in Brussels and Cologne. Rail analysts also predict that greater competition could drive down fares.